"Blue House with White Fence"
"Blue Man in Sand Dunes"
Editor's Note: When I first saw the striking blue-and-yellow image on this issue's cover (last summer at Amy's Bakery Arts Café), I had to look twice to be sure it really was a photograph and not a painting. It's one of the works featured this month in Larry Broder's show at Max's Restaurant, 1052 Western Avenue in West Brattleboro. 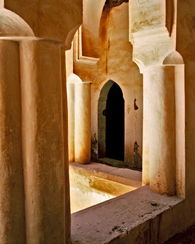 I asked Larry to elaborate on his experience in Morocco, but first here is some background on Larry himself from his website, www.naturallightphotography.org, where you can see many examples of his work. Larry Broder, a Marlboro, Vermont-based photographer, has been practicing his craft for more than 30 years. In the early days of his career, he chose to study under a different well-known photographer every year for ten years. Larry studied with Ernst Haas, John Dominis, William Curtsinger, Philyp Hyde, Bill Haywood, Boyd Norton, Ron Rosenstock, and for six years, Steve Crouch, who took Larry under his wing and taught him the finer art of photography. Steve Crouch was a friend of Ansel Adams and taught at the Ansel Adams Workshop in California. Larry has traveled widely throughout his career, including three trips to Africa, over a dozen trips to Alaska, two trips to Churchill, Manitoba to photograph polar bears, and many trips to the southwestern United States. In addition, he's gone cross-country skiing and photographing in Yellowstone National Park, backpacking and camping the length of the Baja Peninsula, sailing and kayaking in search of whales, and kayaking for nine days along the coast of Ellesmere Island. Most recently, he traveled to Morocco and to Peru, two trips that were the catalyst for a major change in Larry's photography. Larry has always enjoyed his wildlife photography, presenting each subject with a dynamic clarity and a sense of seeing for the first time. But, in the past two years Larry has started to create images, both abstract and realistic, with a clear sense of blurring the lines between photography and painting. In all of his work, Larry respects the honesty of his subject, which is reflected in images that are direct and free of pretense. 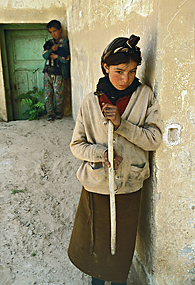 When friends ask what changed his photography, Larry answers with one word, MOROCCO. According to Larry, "I remember clearly the excitement of having my eyes flooded with the unfamiliar intensity of the color in clothing, buildings, walls, windows and even a simple basket of rags sitting alongside a road. Everything seemed more vivid to me -- colors, lines, angles -- and it seemed everywhere I turned there was an image to be created!" In addition to taking photographs for many travel companies, and having many one-man shows, Larry has been published around the world while working for the Discovery Channel. His work has been seen everywhere from Vermont Adventure Magazine to Life magazine, People magazine to the New York Times, and has won many awards including the worldwide Nikon photo contest. Along the way, Larry has also found time to graduate from the Green Mountain Wilderness Survival School, the SOLO backcountry medicine course, and earn a 3rd degree black belt in Karate, along with a black belt in full-contact kickboxing and a black sash in Kung-Fu. Morocco opened a whole new photographic world to me. My instincts had been telling me I wanted to do something new, to branch out beyond nature and wildlife photography. Morocco was my first opportunity. In Morocco I found myself taking three different types of photographs. One was the set-up shot, where I worked with a tripod. One of my favorite places to take set-up shots was in the Yves St. Laurent gardens in Marrakech. These gardens cover 20 acres and are filled with lovely trees and plants. We received special permission to go in there with tripods two hours before the tourists arrived. I spent my entire two hours photographing a fantastic blue building, working to create painterly images. My instincts just took over. The color you see in that series of photographs is exactly what's there. 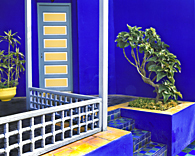 It was the most fantastic blue, a deep cobalt blue which you see a lot of in Morocco, but which I had never seen before. Another place I took set-up shots was in a 17th-century home, continuously lived in to this day. The home is three stories, with a magnificent open courtyard surrounded by columns and archways. I was fascinated by the colors and patina of the entire building. A second type of photograph was the "grab shot," capturing images I noticed as I walked along the streets of the different small towns of Morocco. 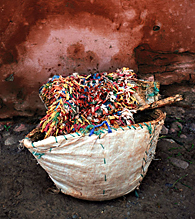 The "Bag of Rags" photograph was taken by the side of a road in a small town. At first, I walked right past it, but my instincts told me to turn around and take another look. It has turned out to be one of my most popular photographs. Another of my "grab shots" was "Sun Shadows." The abstract image of all the lines on the side of an old warehouse again just caught my attention as I walked by. I saw all this sunlight filtering down through the sunshade on the building. I saw the lines, the color, the blue doors and said, "YES -- what an image!!! "&#0;&#0; The photograph of the blue man walking in the sand was taken at 5:30 in the morning, my most favorite time to photograph because the light is soft and there are lots of shadows. I had slept in a camel-hair tent the night before, and I woke up covered in sand from the windstorm that had come through in the night. I went out to catch the sunrise, and as I got to the top of a sand dune, this camel driver was walking to work. I took about half a roll of film of him until my eye caught his tracks with the light and shadows. I knew I had the image I wanted. I also took informal portraits in Morocco. One of my favorite images is of a young girl and her brother, taken in an abandoned mining camp twenty miles from the closest town. This young girl and her family were living off the back of their two mules. I was so taken with her young beauty that I asked permission to photograph her and her brother. I never noticed how dirty she was until I got home and looked at my images. The "Man of Mystery" photograph was also taken very early in the morning. You can see the sunlight in his eyes and his shoes under his arm. The "Man in Blue" was a merchant in front of his shop, as was the young merchant in his shop on a small side street in another tiny town. I'm on my way back to Morocco in May of this year, looking for new sights and experiences, looking forward to the smells and the overwhelming colors that abound in this magnificent country. All my photographs were taken on film with a 35mm Canon or a Pentax 6x7 camera. Visit my website to see my work in color: www.naturallightphotography.org.